Strong, at the main lodge. 6, please inquire for younger children. A 25% deposit is required to secure most reservations. Ninety days prior to arrival, an additional 25% will be collected. In the event of a cancellation more than 90 days prior to arrival, your deposit will be returned less a $100/person cancellation fee. Less than 90 days prior to arrival, your deposit will be returned less a $100/person cancellation fee, if we are able to rebook your space. Drive west on I-70 to Silverthorne. Turn right and drive north on Highway 9 to Kremmling. In Kremmling, turn left and northwest on Highway 40 over Rabbit Ears Pass to Steamboat Springs. Drive past the ski area and through town to the west side of Steamboat on Highway 40. Turn right (north) on County Road 129. There is a stop light at this intersection. Follow CR 129 north about 18 miles. You will go through the town of Clark. Don’t blink or you’ll miss it! Just past Clark, you will cross the Elk River. Immediately after, turn right onto Seedhouse Road (aka County Road 64). Follow Seedhouse Road about five miles until you see our sign on the left-hand side of the road. Take a left into the driveway. Follow our driveway about one mile until you come to the main lodge at the ranch. Nestled deep in the Rocky Mountains, Vista Verde is a truly unique ranch experience for all seasons. 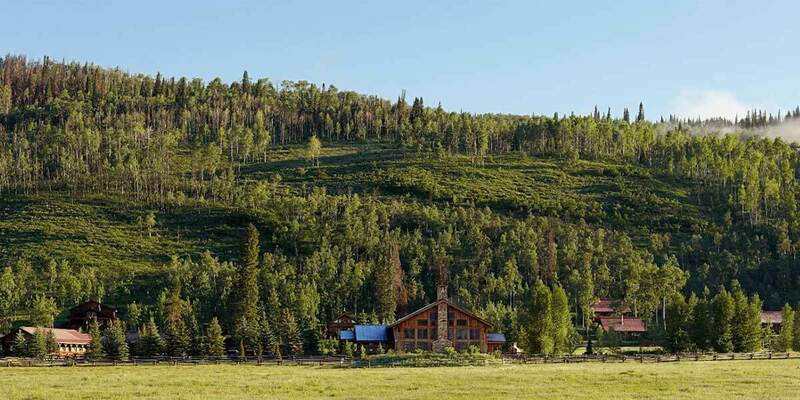 Vista Verde Ranch offers an all-inclusive Colorado resort ranch experience with fine food, diverse activities, luxurious accommodations and personal service in a spectacular setting. The 500-acre property offers accommodation in secluded, spacious log cabins and deluxe lodge rooms. Named after the local mountains, our nine cabins are rustic on the outside and anything but on the inside. Of course, like the mountains, they are beautiful and spectacular without being the same, so no one cabin is better than another. Furnished with a mix of antiques, western art, lodge pole pine beds and handmade log furniture, the cabins are comfortable and luxurious. The cabins range from one bedroom, one bathroom to three bedroom, three bathroom. They are quite spacious, and we fit you to the one that gives the right amount of space for the size of your group. Every cabin has a sitting area with a wood-burning stove to provide ambiance and cozy up to on those cool nights. And, each cabin has its own hot tub on the deck, so you can sit under the stars and soak at the end of the day. Cabin Names: Wapiti, Hinman, Little Agnes, Big Agnes, Farwell, Zirkel, Saddle, Sand, Lost Ranger, Dome. The lodge rooms offer convenience, comfort and wonderful views. Located just up the stairs of the Main Lodge, you don’t even have to put on shoes to come down for breakfast! The three lodge rooms are named after nearby lakes that have captured our fancy. Each has a private bathroom and small sitting area. Recently remodeled and furnished with beautiful western art and handmade king beds, the spacious rooms provide sanctuary to come back to after a long day in the saddle. For those who don’t need as much space or are traveling alone, the lodge rooms are a perfect choice. Please indicate the age of each child in your party. The information you provide in this form will be sent to the property directly, and a representative from the property will respond to you as soon as possible. Whisk away your sweetheart to celebrate Valentine’s Day in a romantic winter wonderland. *Select times are reserved for adult guests only. *Family times are for those with children six years and up. *You are welcome to check in anytime after 4 PM on the day of arrival and check-out is at 9:30 AM on the day of departure.